Sugar Research Institute Scholarship recipient Joseph Bonassi’s advice to engineering students is to ask plenty of questions and follow your interest if you want to succeed as an engineer in the sugar milling industry. The third year James Cook University student recently completed four weeks placement at Isis Central Sugar Mill and said he was both shocked and ecstatic to be awarded the prestigious Sugar Research Institute Scholarship. “As I have worked in a sugar mill previously, I have a fairly good idea of how the main processes operate. However, each mill is individual along with its employees. Being at Isis for just a brief time I already feel extremely lucky to be working with engineers who have been in the industry for such a long time,” Mr Bonassi said. 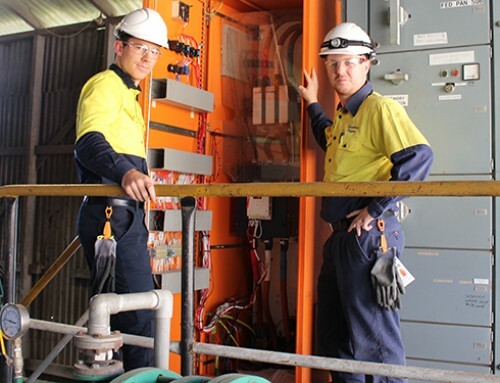 Isis Central Sugar Mill Assistant Chief Engineer Kelly Ryan said work placements provide the students with a valuable learning experience. “Work placements in the sugar industry provide engineering students with exposure to a wide variety of process systems and machinery as well as an insight into the maintenance requirements of a sugar factory,” Mr Ryan said. According to Sugar Research Institute’s Training Services Manager Alison Clift, Joseph was one of four successful scholarship recipients chosen on their proven ability to work well in a team environment and to create positive practical outcomes. “Sugar Research Institute received a high number of applications from undergraduates studying engineering across Australia for the 2015 scholarship intake,” Ms Clift said. The scholarship program aims to encourage the participation of high calibre students from engineering and science disciplines into Australian sugar mills.